SANTA MONICA — “Never Again,” a vigil to remember the 70th anniversary of the atomic bombing of Hiroshima and Nagasaki, will be held on Wednesday, Aug. 5, at 4 p.m. sharp (please arrive early) at the “Chain Reaction” peace sculpture on the 1800 block of Main Street at the Santa Monica Civic Center. 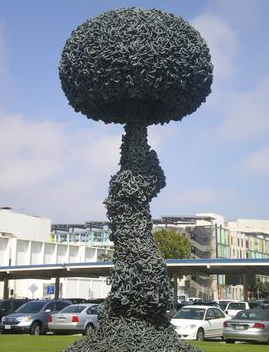 The “Chain Reaction” peace sculpture in Santa Monica. Parking is available in an adjacent lot at 1821 Main St.
A moment of silence will be observed at 4:15 p.m., the exact time the first bomb was dropped over Hiroshima (8:15 a.m. on Aug. 6, Japan local time). The Hiroshima Peace Flame will be presented by Rev. Ryuzen Hayashi of Koyasan Buddhist Temple. Speakers will include Junji Sarashina of the American Society of Hiroshima-Nagasaki A-Bomb Survivors; Dr. Jimmy Hara of Physicians for Social Responsibility-Los Angeles; Blase Bonpane of Office of the Americas; Alice Soto of Pax Christi; Stephen Rohde of Interfaith Communities United for Justice and Peace; and Robert Scheer, editor-in-chief of TruthDig. “On Aug. 6, 1945, the U.S. dropped an atomic bomb over Hiroshima, killing 130,000 people,” organizers said. “Three days later, a second bomb exploded over Nagasaki, killing 70,000. Other countries developed their own nuclear weapons, and humanity became hostage to the ever-present threat of nuclear annihilation. Whether by accident or intent, we remain at risk — and all that we hold dear hangs in the balance. For more information, visit www.psr-la.org or contact Denise Duffield at [email protected] or (213) 689-9170, ext. 104.